Dr. Zhang is a Laboratory Fellow in the Energy Processes & Materials Division at PNNL. He is the PI on PNNL's efforts on Energy Storage for Transportation supported by the DOE/EERE/OVT office and PNNL's Transformation Materials Science Initiative. 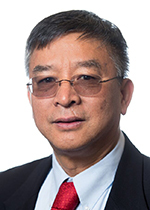 He has 24 years of experience in the development of energy storage devices, including lithium-ion batteries; thin-film, solid-state batteries; Li-S batteries; lithium-air batteries, and electrochromic devices. Prior to joining PNNL in June 2007, he served for seven years as Chief Technology Officer of Excellatron Solid State LLC in Atlanta, Georgia. His responsibilities at Excellatron included strategic planning, identification of R&D direction, review of all internal programs, funding allocation for internal programs, and oversight of all subcontractor programs. He was also responsible for day-to-day performance of the technical team for development of thin-film lithium batteries and other energy related products. From 1998 to 2000, he served as the Director of Product Development at Macro Energy-Tech, Inc. in Redondo Beach, California, where he was responsible for setting up a pilot line for production of polymer lithium-ion batteries. Prior to that, from 1990 to 1998, he was a Postdoctoral Fellow/Staff Scientist/Senior Scientist at the National Renewable Energy Laboratory where he managed several lithium-ion-battery related projects. Dr. Zhang holds 23 patents (with another 17 patents pending) and has more than 250 papers published in professional journals. Dr. Zhang's research interests are energy storage materials and devices to include lithium batteries, lithium ion batteries and Li-S batteries; energy saving materials and devices to include electrochromics materials and devices and thermochromic materials and devices; solid state electrolyte and solid state batteries to include thin film batteries and solid state Li-S batteries. Ph.D., in Experimental Condensed Matter Physics, University of Kentucky, 1990. M.S. in Theoretical Physics, Dalian University of Technology, Dalian, China, 1984. B.S. in Applied Physics, Dalian University of Technology, Dalian, China, 1982. U.S. Patent No. 10,246,337, April 2, 2019, "SAFE AND LOW TEMPERATURE THERMITE REACTION SYSTEMS AND METHOD TO FORM POROUS SILICON ". U.S. Patent No. 10,243,206, March 26, 2019, "HIGH CAPACITY AND STABLE CATHODE MATERIALS". U.S. Patent No. 10,170,795, January 1, 2019, "Electrolyte for high efficiency cycling of sodium metal and rechargeable sodium-based batteries comprising the electrolyte". U.S. Patent No. 9,865,900, January 9, 2018, "SOLID ELECTROLYTE INTERPHASE FILM-SUPPRESSION ADDITIVES ". U.S. Patent No. 9,722,277, August 1, 2017, "ELECTROLYTE FOR BATTERIES WITH REGENERATIVE SOLID ELECTROLYTE INTERFACE". U.S. Patent No. 9,577,250, February 21, 2017, "Thick Electrodes Including Nanoparticles Having Electroactive Materials and Methods of Making Same". U.S. Patent No. 9,343,736, May 17, 2016, "LITHIUM COMPENSATION FOR FULL CELL OPERATION ". U.S. Patent No. 9,184,436, November 10, 2015, "Methods and Energy Storage Devices Utilizing Electrolytes Having Surface-Smoothing Additives". U.S. Patent No. 9,039,788, May 26, 2015, "Methods for making anodes for lithium ion batteries". U.S. Patent No. 8,980,460, March 17, 2015, "Methods and Electrolytes for Electrodeposition of Smooth Films". U.S. Patent No. 8,765,278, July 1, 2014, "HIGH-ENERGY METAL AIR BATTERIES ". U.S. Patent No. 8,758,947, June 24, 2014, "Graphene-Based Battery Electrodes Having Continuous Flow Paths". U.S. Patent No. 8,673,067, March 18, 2014, "Immobilized Fluid Membranes for Gas Separation". U.S. Patent No. 8,481,187, July 9, 2013, "HIGH-ENERGY METAL AIR BATTERIES ". U.S. Patent No. 8,110,167, February 7, 2012, "Nanowire Synthesis from Vapor and Solid Sources". Cao R., J. Qian, J. Zhang, and W. Xu. 2015. "Organic Cathode Materials for Rechargeable Batteries." In Rechargeable Batteries: Green Energy and Technology, edited by ZC Xhang and SS Zhang. 637-671. New York, New York:Springer-Verlag. PNNL-SA-105646. Xu W., F. Ding, X. Chen, Y. Zhang, J. Qian, E.N. Nasybulin, and R. Cao, et al. 2014. "Dendrite-Suppression Electrolytes for Lithium-Metal and Lithium-Ion Batteries." In Proceeding of the 46th Power Sources Conference, June 9-12, 2014, Orlando, Florida, 374-377. New York, New York:Power Sources Conference. PNNL-SA-101982. Zhang J., J. Xiao, and W. Xu. 2014. "Primary Lithium-Air Batteries." In The Lithium Air Battery: Fundamentals, edited by N Imanishi, AC Luntz and P Bruce. 255-289. New York, New York:Springer. PNNL-SA-112423. Zheng J., J. Xiao, X. Yu, L. Kovarik, M. Gu, F. Omenya, and X. Chen, et al. 2012. "Enhanced Li+ ion transport in LiNi0.5Mn1.5O4 through Control of Site Disorder." Physical Chemistry Chemical Physics. PCCP 14, no. 39:13515-13521. PNNL-SA-88177. Zhang J., and J. Liu. 2011. "Development of High Energy Cathode (PNNL)." In FISCAL YEAR 2010 ANNUAL PROGRESS REPORT FOR ENERGY STORAGE R&D. 366-369. Washington, D.C.:U.S. Department of Energy. PNNL-19899. Zhang J., P.G. Bruce, and G. Zhang. 2011. "Metal-Air Batteries." In Handbook of Battery Materials, 2nd Edition, edited by C Daniel and JO Besenhard. 759-796. Weinheim:Wiley-VCH. PNNL-SA-71568. Liu J., and J. Zhang. 2010. "Development of High Capacity Anodes (PNNL)." In FY 2009 Annual Progress Report for Energy Storage R&D. 297-300. Washington Dc:US Department of Energy, Energy Efficiency & Renewable Energy. PNNL-19934. Wang D., J. Xiao, W. Xu, and J. Zhang. 2010. "High Capacity Pouch-Type Li-air Batteries." Journal of the Electrochemical Society 157, no. 7:A760-A764. PNNL-SA-70548. Xu W., J. Xiao, D. Wang, J. Zhang, and J. Zhang. 2010. "Crown Ethers in Nonaqueous Electrolytes for Lithium/Air Batteries." Electrochemical and Solid-State Letters 13, no. 4:A48-A51. PNNL-SA-69721. Xu W., J. Xiao, D. Wang, J. Zhang, and J. Zhang. 2010. "Effects of Nonaqueous Electrolytes on Primary Li-Air Batteries." In Proceedings of the 44th Power Sources Conference, 43-46. Fort Monmouth, New Jersey:US Army Electronics Research and Development Laboratory. PNNL-SA-71608. Williford R.E., and J. Zhang. 2009. "Air Electrode Design for Sustained High Power Operation of Li/air Batteries." Journal of Power Sources 194, no. 2:1164-1170. PNNL-SA-65788. Williford R.E., V.V. Vishwanathan, and J. Zhang. 2009. "Effects of Entropy Changes in Anode and Cathode on Thermo Behavior of Lithium Ion Batteries." Journal of Power Sources 189, no. 1:101-107 (Sp. Iss. SI). PNNL-SA-61086. Liu J., G.H. Cao, Z. Yang, D. Wang, D.L. DuBois, X.D. Zhou, and G.L. Graff, et al. 2008. "Oriented Nanostructures for Energy Conversion and Storage." ChemSusChem 1, no. 8-9:676-697. PNNL-SA-61634.